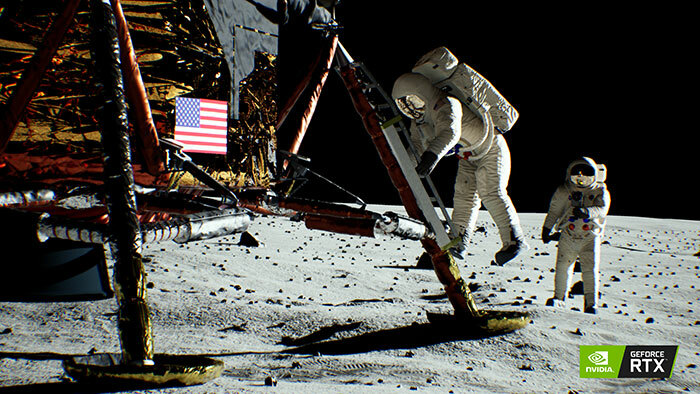 Back in September 2014 Nvidia put its graphics engineers to work on a tangential project which it claimed debunked conspiracy theorist assertions that the Apollo 11 moon landing was faked. One of the moon-landing-deniers favourite drums to beat concerned how light reflected off Neil Armstrong's suit, to cast light on Buzz Aldrin as he stepped off the lunar lander. Nvidia utilised Epic's Unreal Engine 4 and Voxel-Based Global Illumination (VXGI), a key Maxwell technology, to recreate the animated scene and show that the original film was realistic and correct in the given environment. A few weeks after the above news blog post from Nvidia it followed up with a release of the Apollo 11 Lunar Landing Demo, so you could run the demo on your own machine. This 484MB download is still available. 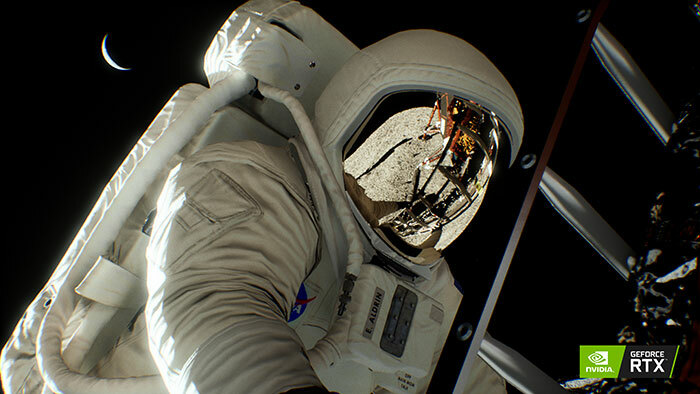 Last week Nvidia was busy at GTC Europe and showed off an updated Lunar Landing demo with the most accurate real-time lighting that modern graphics tech can render - RTX using an Nvidia Turing GPU. CEO Jensen Huang took to the stage to declare that the new raytracing demo re-confirmed Nvidia's earlier conclusion: the photo looks the way it would if it were taken on the moon. "This is the benefit of Nvidia RTX," Huang said. "Using this type of rendering technology, we can simulate light physics and things are going to look the way things should look." Again Epic's Unreal Engine was used but with updates for RTX the engine can display much more realistic lighting with reflections, shadows, ambient occlusion, global illumination and other natural visual phenomena. After painstakingly checking how light interacts to all the materials in the scene from the space suits to the lunar lander rivets, Nvidia asserts "the illumination of the astronaut in the photo wasn't caused by something other than the sun — such as studio lights — but by light doing what light does". To wrap up Nvidia's blogger playfully suggests that "Either the Apollo 11 landing is real. Or NASA figured going to the moon was too hard, built a time machine instead, and sent someone 50 years into the future to grab an Nvidia RTX GPU." You can watch the full 2hr+ Nvidia GTC Europe 2018 keynote on YouTube. The Lunar Landing section is about 22 minutes in. I think there's been enough moon landing conspiracy debunking for now. Perhaps Nvidia could move on to the alarmingly fashionable flat earthers and/or climate change deniers for its next 'slay them with science' demos. They considered it, but it was cheaper to send someone to the moon instead. Shame it doesn't support DXR. Perhaps RTX is required as Nvidia's DXR support is not complete? I don't think a lunar landing demo will suddenly convert moon-landing-deniers into believers, Buzz Aldrin had the right idea IMO as if a mountain of evidence hasn't convinced them nothing will. If that's true, where's the download link?